With the rapidly increasing volumes of data from social, mobile, IoT, and endpoints, it is more important than ever to have the tools you need to tap into the hidden knowledge that can be found within. The real value from this data will come from your ability to gain insights and make better business decisions. Bring together your data and turn this into information you can see and analyze - to get ahead of the pack and gain competitive advantage. Selecting the right business intelligence platform isn't easy. You need to get to your data - to see it well… without compromise. The choice can be overwhelming. Alacrinet can help. Before making final decision on your analytics tools, talk to the experts at Alacrinet. Our BI experts understand the capabilities of the leading tools on the market. We can help you see what each vendor’s strengths are - and what they are not. We can help you select the right tools for your needs - based on your environment - your skills and your data sources. We listen to our clients and to leading industry analysts to ensure we are developing our skills and delivering solutions using the best technologies in the market. "IBM offers a broad and comprehensive BI platform with a touch of AI." 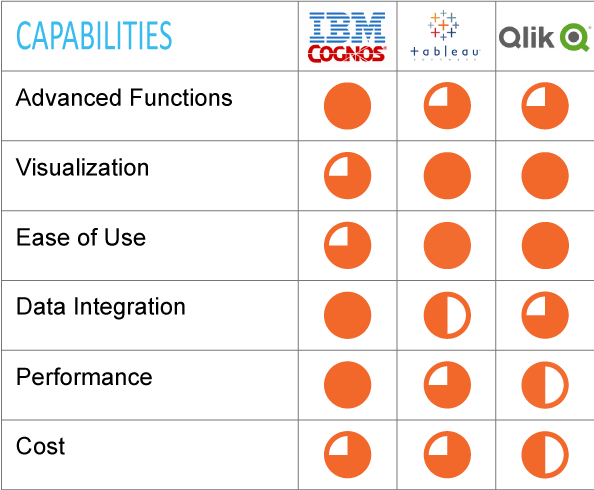 "Tableau's clean, intuitive, easy-to-navigate UI and insights presentation earns it a top spot in the market"
"Qlik continues to differentiate with its powerful associative BI engine"
We work with the leading analytics vendors to offer you the best solutions for analytics that are right for your environment. IBM Cognos Analytics is a complete business intelligence platform that business users can use to monitor, explore and share insights from your data. Cognos has strong visualization capabilities to create dashboards and reports - and integrates with a wide range of data sources. Cognos provides integration with what you have - out of the box. Tableau offers a suite of comprehensive, highly intuitive data visualization and exploration tools that are easy to use. It helps people quickly analyze, visualize and share information. With Tableau, you can get answers from data quickly, with no programming required. Qlik provides an intuitive platform solutions for self-service data visualization, guided analytics applications, embedded analytics and reporting. Qlik solutions can be used to visualize and explore information, generate insight and make better decisions. Microsoft Power BI - if your organization is heavy Microsoft user looking at advanced analytics you may be working also with Microsoft Power BI - a fast growing set of tools for the Microsoft environment. This is a solid choice for your office environment - and Alacrinet can help you find the advanced analytics platform that will complement your Power BI environment. The right analytics solution depends on your IT and business environment. Alacrinet will work with you to identify the best solutions for your business for these offerings and more.